The Berkeley Art Council is pleased to announce the winners for this year’s Dance Works 2016 event. L-R- Jane Horst, Dance Works 2016 Coordinator, Arianna Pittinger, Emily Thompson, Tuition waiver winners for 2017. Rachael Avey, WVU Summer Dance Camp Scholarship, and Beka Avey, Radford University Summer Dance Intensive, Scholarship winner, and Genevieve Rochefort, Tuition Waiver winner. Held at Musselman High School on Feb. 26 and 27, over 120 dancers participated in Dance Education classes and a well-attended gala performance on Saturday night. 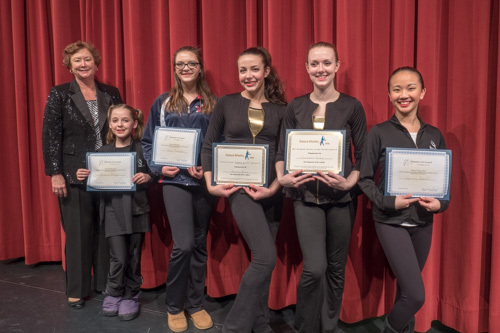 The Scholarship awardees were selected by a panel of master dance instructors who, observed and selected the students who excelled during the class program. The Berkeley Art Council awarded 4 tuition waivers for next year’s program, one for a dancer at each level of Beginning, Intermediate, and Advanced-intermediate and advanced. The dancers ranged in age from 10 to 18 years. This year’s waiver winners were- – Jacki Power, Dance Dimensions, -Arianna Pittinger, Inwood performing Arts, Emily Thompson, Synergy Dance Team, Washington County High and Genevieve Rochefort, Inwood Performing Arts. The WVU and Radford University Dance Departments also presented scholarships for their Summer Dance Camps at the Dance Works event. The scholarship winners for WVU submitted a 1 page essay about “What Winning a WVU Dance Camp Scholarship Would Mean to Me?” and auditioned for the scholarship award. Winners were selected by the professors of WVU and Radford University’s Dance Departments. The winner of the WVU Summer Dance Camp Scholarship is Rachael Avey, of Turning Pointe Studio. Runner up for the WVU Summer Dance Camp is Arianna Pittinger, of Inwood Performing Arts. The partial scholarship to the two week Radford University Summer Intensive, is Beka Avey from Turning Point Dance Company.